I have finally filled my Large Z Palette! It is full of Makeup Geek and MAC Eye Shadows. I did a post a while ago with my half filled palette so I thought it was time to share my pretty palette. Makeup Geek Vanilla Bean | This shade is the perfect all over base shade. As i am quite pale it doesn't show up as pigmented even though it is! Makeup Geek Shimma Shimma | A pretty shimmery shade perfect to highlight the brow bone and inner corners of my eyes. MAC All That Glitters | I LOVE this shade. A antique looking shimmer shade. Looks lovely all over the lid. 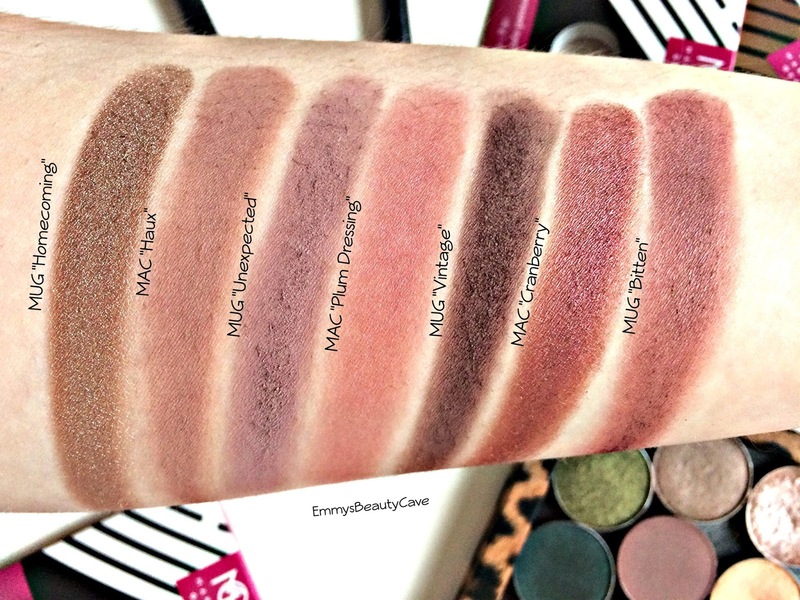 Makeup Geek Purely Naked | One of my favourite crease shades EVER! It is usually the second shade I use in my crease and it looks gorgeous and blends like a dream. Makeup Geek Brownie Points | This shade was only released on Beauty Bay 5 days ago! I needed a dark chocolate brown and now I have it. 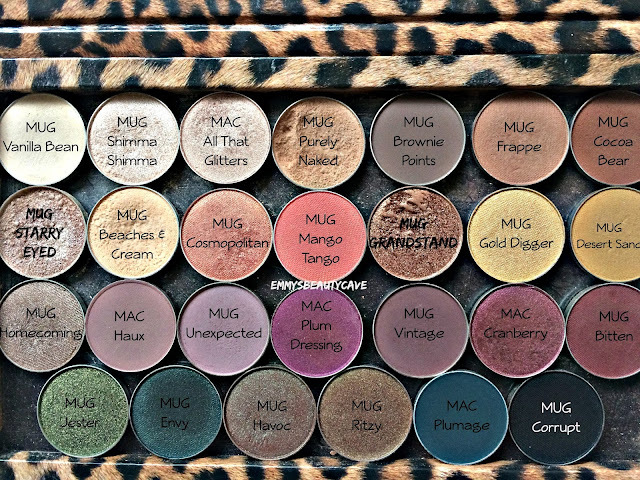 Makeup Geek Frappe | A warm toned brown again good for the crease and outer corners. Makeup Geek Cocoa Bear | At first I wasn't impressed but now I am. Perfect outer crease shade for many looks. Makeup Geek Starry Eyed (Foiled £7.95) | My favourite foiled shadow by far! These are definitely worth the extra money. I use this all over the lid but also as a cheekbone highlight! 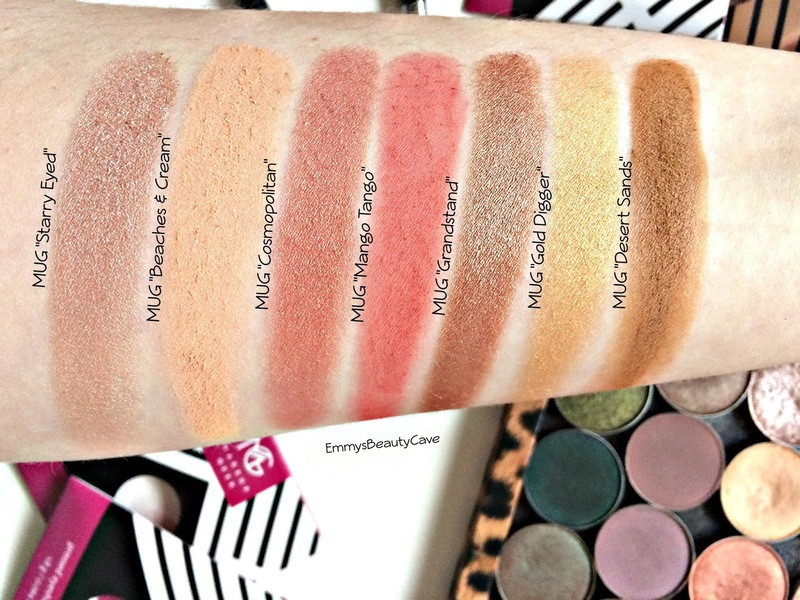 Makeup Geek Beaches & Cream | This is my go to first crease/transition shade. It creates the perfect transition for any shade. Makeup Geek Cosmopolitan | One of my first shades I purchased, it is a pretty pinky coral shimmer shade. Will be my go to lid shade for Spring and Summer. Makeup Geek Mango Tango | My newest shade and im in love. It is a bright pinky coral matte shade. All over the lid, crease or under the bottom lash line. 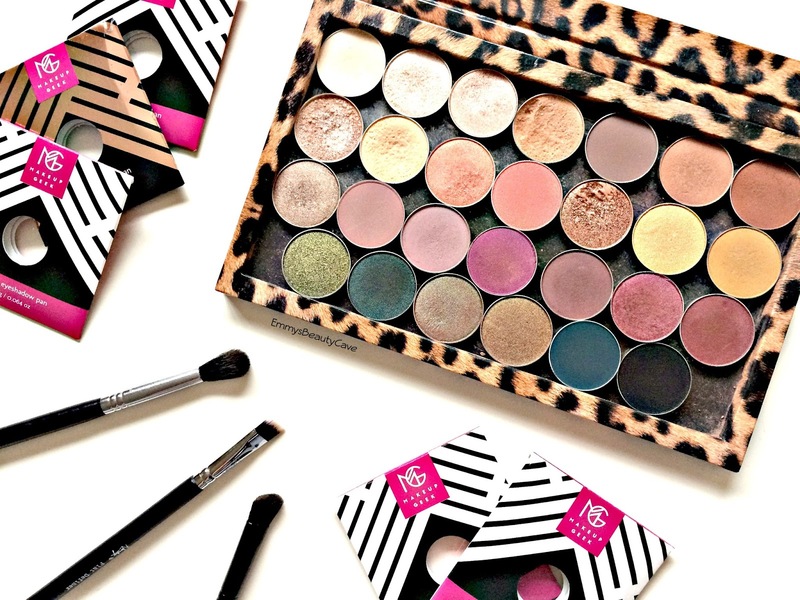 Makeup Geek Grandstand (Foiled £7.95) | The perfect bronze. Whenever i wear this shade all over my lid I always get compliments. Makeup Geek Gold Digger | I wanted a shimmery gold and this is insanely good. The prettiest gold shade I have ever seen. 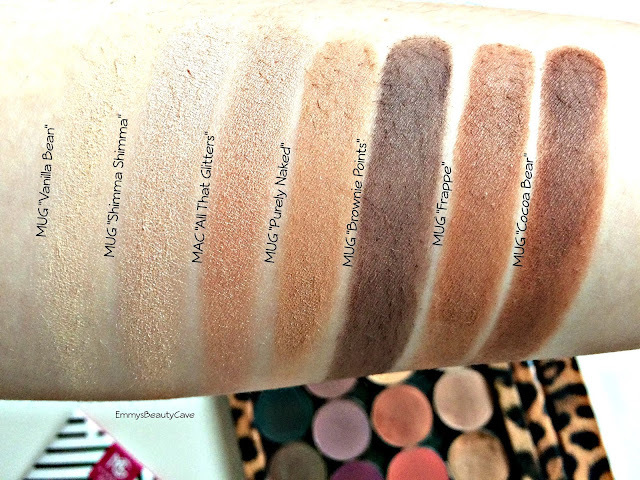 Makeup Geek Desert Sands | One of my favourite shades by far! It is a mustard shade which looks amazing in the crease. Makeup Geek Homecoming | Ok not a purple but it is gorgeous. It is a brown shimmer and I love it. MAC Haux | One of my very first MAC Shades, It is a light purple which works well in the crease. Makeup Geek Unexpected | This shade is super creamy and blends really well. Looks amazing all over the lid for a subtle look or in the crease for a darker eye. MAC Plum Dressing | Ah this is the shade that lets me down. In the pan it looks super shimmery but when you swatch it, it doesn't come across like that. Luckily when using a brush it applies more product. Makeup Geek Vintage | A darker matte purple works lovely in the crease/outer corner. MAC Cranberry | A hyped about shade that is well worth it! I love this in Winter all over my lid. Makeup Geek Bitten | A deep red/purple, my favourite outer corner shade mixed with Cocoa Bear. Makeup Geek Jester (Foiled £7.95) | One word.. Gorgeous! This shade is stunning. It looks amazing all over the lid. Makeup Geek Envy | A darker shimmery green, reminds me of mermaids! 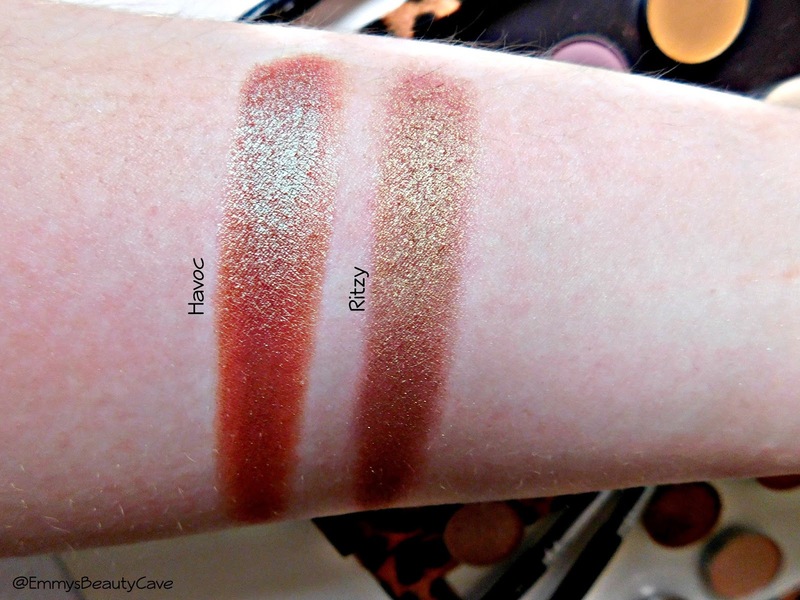 Makeup Geek Havoc & Makeup Geek Ritzy (Duo Chrome) | These Duo Chrome Shadows are stunning! They are two toned and look different in different lights. As you can see in both pictures they have hints of different colours. MAC Plumage | I don't know why this is called plumage as plum to me is purple? This is more of a deep turquoise. 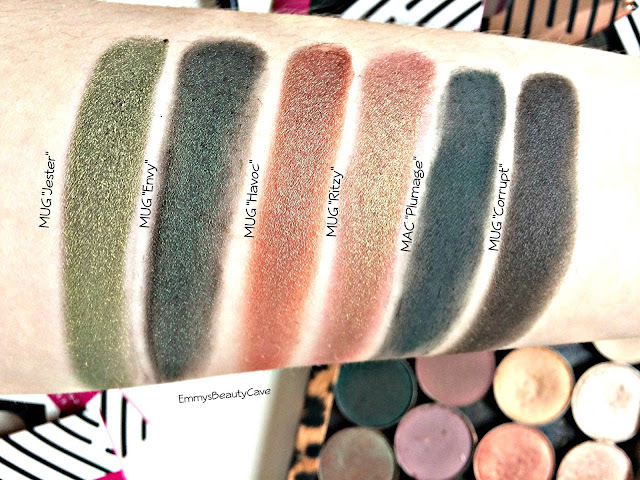 Makeup Geek Corrupt | Every palette needs a black right?! I do find this shade not to be as creamy as the rest but it is still extremely pigmented. I am so happy with all of the shades in my palette and how I can create endless looks. You can buy Makeup Geek Eye Shadows from Beauty Bay or the Makeup Geek website if you are not from the UK. What are your favourite shades?